The Treasure is an integral part of the extraordinary artistic patrimony of the Scuola, and is now housed in the room constructed for it by Giorgio Fossati between 1770 and 1773. The grand 18th century cupboards here were specially made to contain the treasure of the Scuola’s ‘silverware’, which was once second only to that of St. Mark’s Basilica, but was seriously depleted after the fall of the Republic. Almost a ton of silver and several kilos of gold were obtained from it! Fortunately, the objects for religious worship and those of lower intrinsic value were spared. Thus some extraordinary pieces are still preserved. 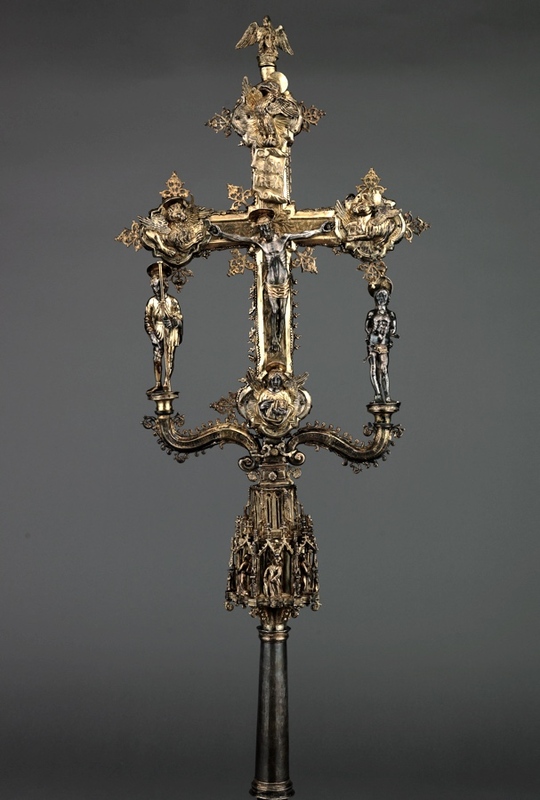 These include, in the first cupboard, a small altar with the Madonna and Child, a small pax-board in soapstone, and a branch of coral skilfully transformed into an extraordinary candlestick. 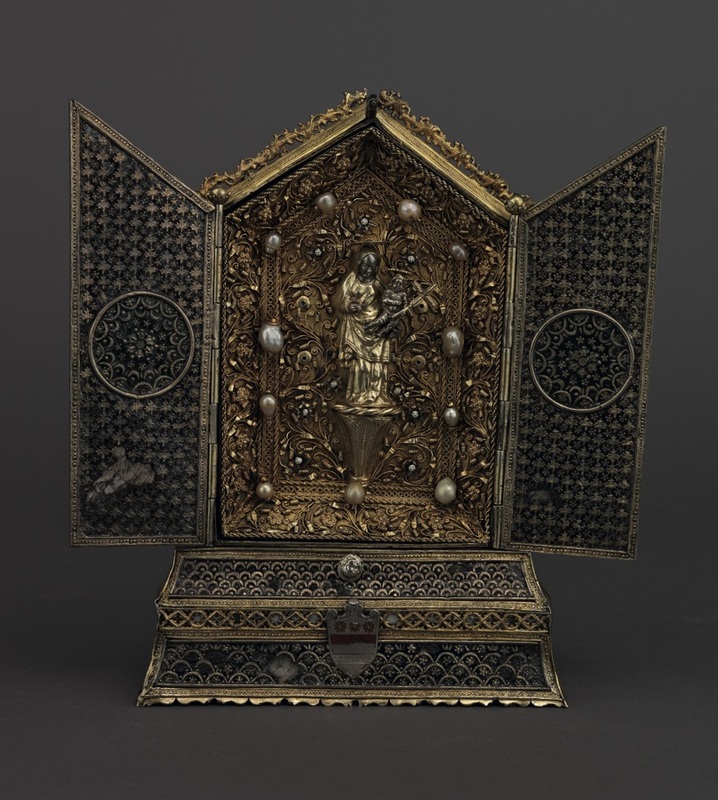 Another cupboard contains some pieces datable between the 1520s and 1530s, one of the Scuola’s periods of maximum splendour, when its income was extremely high thanks to the cult of the patron saint and of the Christ carrying the cross, which are both pictured on the gilded silver plaques of the sumptuous binding of the statute, or mariegola. 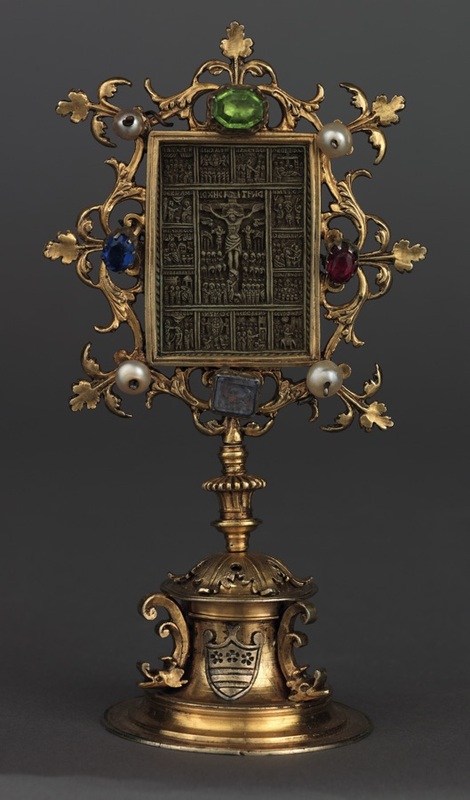 Among the relics stands out the monumental Reliquary of St. Andrew’s finger, which was made in about 1560 and cost only a little less than Tintoretto’s Crucifixion! The Reliquary of St. Roch’s finger dates to 1676 1676 and is positioned at the top of the large black portable stage or soler. 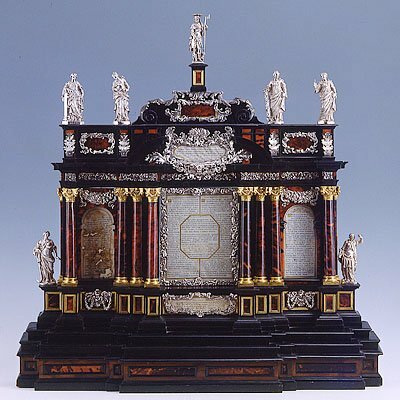 The sumptuous set of walnut, ebony and tortoiseshell architectural altar cards or cartegloria, with their silver decorations and statues, also comes from about the same time. 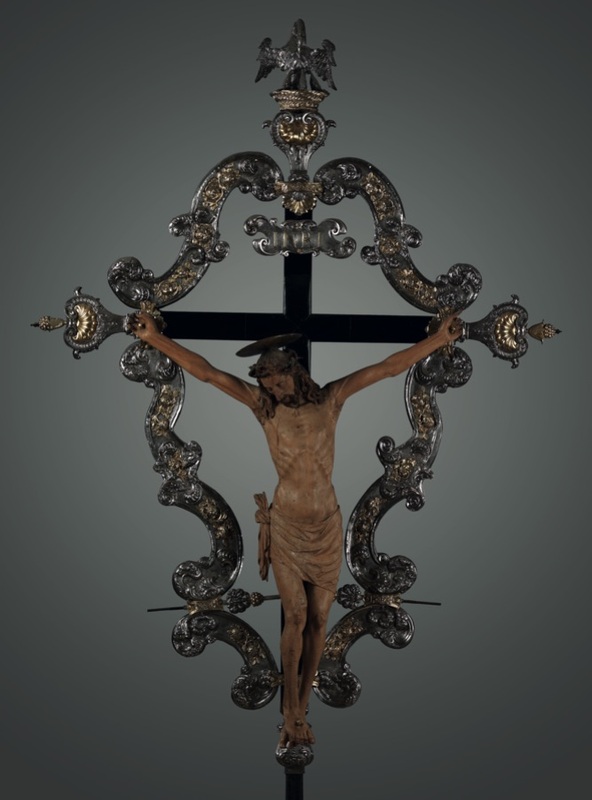 Finally, we must not forget the late 15th-century Processional cross, one of the first precious objects that the Scuola owned. At the foot of the cross, instead of the traditional small figures of the Madonna and St. John, are St. Roch and St. Sebastian, protectors against the plague. Among the Scuola’s possessions is also a precious Mamluk carpet which early documents refer to as “tapedo grando caierin” indicating its origins in the Cairo workshops, which continued their traditional production even after the conquest of Mamluk Egypt by the Ottomans, weaving carpets of many shapes and sizes, which were bought in great quantities by Genoese and Venetian merchants. Typical of these late ‘Mamluks’ is the ‘kaleidoscopic’ design with medallion motifs, based on only three colours (red, blue and green), without white highlighting or brown borders. Today fewer than ten of such carpets survive worldwide, among them this one, which boasts a refined and intricate decorative pattern, quite similar to the Blumenthal carpet in New York’s Metropolitan Museum, and perhaps larger (377 x 988 cm). In all likelihood it was bought by the Scuola in the early months of 1568, and immediately used to cover the high table in the Sala dell’Albergo. Continuing to serve this purpose in succeeding centuries, the Mamluk carpet supplied therefore a worthy finishing touch to a room whose pictorial decoration had only recently been completed by Jacopo Tintoretto. Given the great size of the carpet and the necessity of protecting it from damage, it is not always possible for it to be on display. Pax-board in soapstone , Veneto, XVth c.
Processional cross, Veneto, second half of XVth c.
Processional cross, Veneto, XVIIth c.